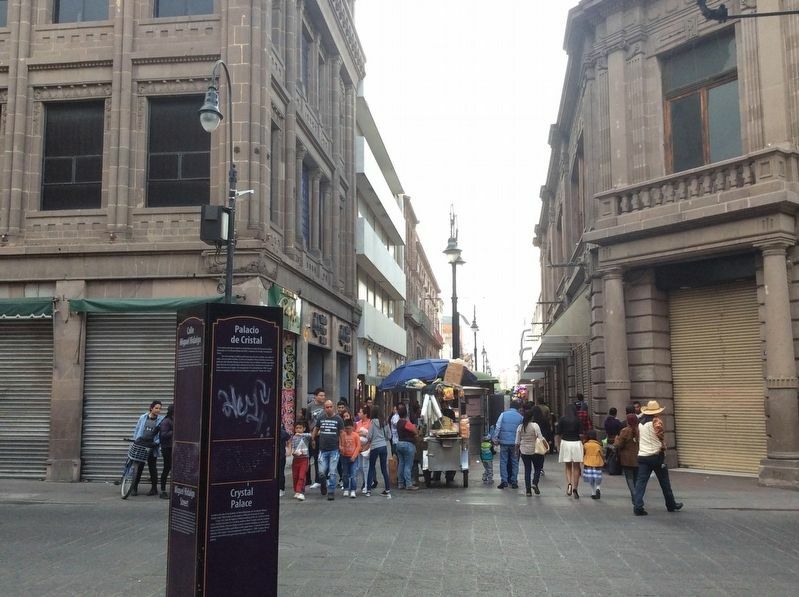 Es la zona comercial más concurrida del Centro Histórico de la Capital Potosina y forma, junto con la calle Ignacio Zaragoza y la Calzada de Guadalupe, el eje comercial peatonal más largo de Latinoamérica. En este tramo de 2.2 km., comprendido por estas tres calles, se localizan muchos de los edificios más relevantes de San Luis Potosí como: la Alhóndiga, el Palacio Mercantil, el Palacio de Cristal, el Palacio Municipal, la Catedral Metropolitana, la Caja del Agua, el Internado Damián Carmona, la XII Zona Militar, la ex Penitenciaría del Estado y la Basílica de Guadalupe, entre otros. Se encuentra ubicado en donde se encontraba el templo del Beaterio de Niñas Educandas de San Nicolás Obispo del XVIII, a expensas de Nicolás Fernando de Torres. The Miguel Hidalgo Street can be seen here extending into the background to the north. A portion of the Crystal Palace can be seen to the left. eléctrico de la región. Fue inaugurado el 4 de diciembre de 1909. Su apariencia acristalada y estilo ecléctico le dieron el nombre d “Palacio de cristal”. This is the busiest commercial area of the Historic Center of the Potosina Capital and together with Ignacio Zaragoza Street and the Calzada de Guadalupe road, it forms the longest pedestrian commercial avenue in Latin America. Along this stretch of 2.2 km., comprised of these three streets, are many of the most relevant buildings of San Luis Potosí such as: the Alhóndiga, the Palacio Mercantil, the Palacio de Cristal, the Palacio Municipal, the Cathedral Metropolitana, the Caja de Agua, the Internado Damián Carmona, the XII Zona Militar, the former Penitentiary of the State, and the Basilica de Guadalupe, among others. Located at the site of the Beaterio de Niñas Educandas de San Nicolás Obispo Temple of the 18th Century, at the expense of Nicolás Fernando de Torres. It was in its time the highest Porfirian building of the city, with four levels and a metallic structure. It is a work by architect Henri Guindon and was ordered by Eduardo Meade, who was trying to create a modern building to enclose businesses on the ground floor and offices on the upper floors. It had the first electric elevator of the region. It was inaugurated on December 4, 1909. Its glass-like appearance and eclectic style gave way to its name: “Palacio de Cristal” (Crystal Palace). Location. 22° 9.166′ N, 100° 58.573′ W. Marker is in San Luis Potosí, San Luis Potosí, in Municipality of San Luis Potosí. Marker is at the intersection of Álvaro Obregón and Calle Miguel Hidalgo, on the left when traveling west on Álvaro Obregón. Touch for map. Marker is in this post office area: San Luis Potosí 78000, Mexico. Touch for directions. Other nearby markers. At least 8 other markers are within walking distance of this marker. The Crystal Palace (a few steps from this marker); Former House of the Vicereine (within shouting distance of this marker); The House of the Vicereine (within shouting distance of this marker); Arms Square / City Hall (about 90 meters away, measured in a direct line); Municipal Palace (about 90 meters away); Government Palace / Vicereine’s House (about 120 meters away); Former Othón Theater (about 150 meters away); Metropolitan Cathedral / Vicereine's Balcony (about 150 meters away). Touch for a list and map of all markers in San Luis Potosí. More. 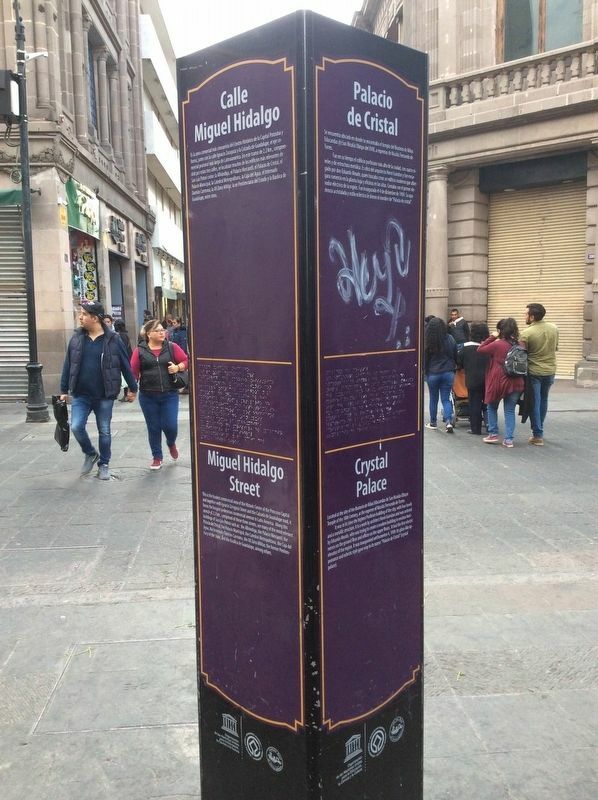 Search the internet for Miguel Hidalgo Street / Crystal Palace. Credits. This page was last revised on April 10, 2019. This page originally submitted on April 10, 2019, by J. Makali Bruton of Querétaro, Mexico. This page has been viewed 39 times since then. Photos: 1, 2. submitted on April 10, 2019, by J. Makali Bruton of Querétaro, Mexico.